It’s official folks, NJ Beer Company is having its launch party at the Coppermine Pub in North Arlington NJ on Sat May 15th. I have been following Matt Steinberg’s journey to get to the wondrous spot for several months. 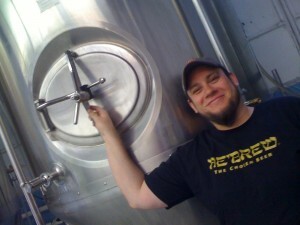 Back in Nov of ’09, I first met Matt at his deserted brewery, there was no equipment, electricity, or gas. Since that day he has overcome production delays, shipping delays, and customs delays with his brewing equipment, not to mention mistakes by local utility companies. But, aside from all of these start-up set backs, his dream of opening a Brewery in North Jersey is finally a reality! Come out this weekend and support the Newest Craft Brewery! Details for Saturday, 5/15 @ Coppermine…. The beer will be on all day , but the event part of it is from 3-8. Matt will probably be there most of the day. As for the event part… NJ Beer Co will be intermittently raffling off some t-shirts and stuff, we’ll have 3 dishes to pair with each beer, one’s a little appetizer, the other a little sandwich, and finally a dessert. There will be a cask for the hand pump, the Pale A we dry hopped the begeezus out of to the point that I think we could call the cask version an IPA. If you can’t make it…. Launch Party round 2 will be at the Iron Monkey in Jersey City, easily accessible to NYC from the Exchange Place PATH station, couple block walk on Friday 5/21. We’ll run that from happy hour (4) to close and if you make it to midnight, you can wish Matt a happy birthday! Thanks Mike. I know Matt appreciates all the support he can get. For my local Jersey reads check out Mike’s site Bergenation.com for great reviews on restaurants, bars, and things going on in North Jersey! Bergenation is one of my regular stops! Peter, guess what? I might actually be able to make this event albeit earlier rather than later. Weather I make it or not, I think its a great accomplishment and I couldn’t be happier for Matt. Just found out i can go, I will have my camera!!! Beware!! !